Human Rights Watch recently released a report on education of girls in Pakistan. The results highlight that 22.5 million children are not enrolled in educational facilities—the majority of which are girls. Balochistan is the area of the country where education of girls is the lowest. However, it is of no surprise, as these are the regions that are often neglected in terms of infrastructural development. The Pakistan government is failing to educate a huge proportion of the country’s girls, Human Rights Watch said in a report released today. 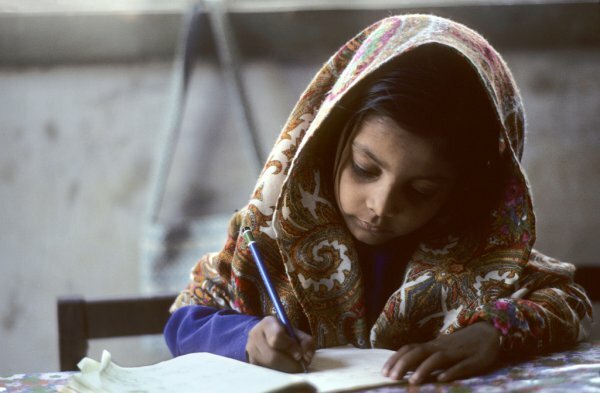 The 111-page report, “‘Shall I Feed My Daughter, or Educate Her?’: Barriers to Girls’ Education in Pakistan,” concludes that many girls simply have no access to education, including because of a shortage of government schools – especially for girls. Nearly 22.5 million of Pakistan’s children – in a country with a population of just over 200 million – are out of school, the majority of them girls. Thirty-two percent of primary school age girls are out of school in Pakistan, compared with 21 percent of boys. By ninth grade, only 13 percent of girls are still in school. Human Rights Watch interviewed 209 people for the report – most of them with girls who never attended school or were unable to complete their education, and their families – in all four of Pakistan’s provinces: Balochistan, Khyber Pakhtunkhwa, Punjab, and Sindh. Human Rights Watch also interviewed parents, educators, experts, and activists, and visited schools. Among the factors keeping girls out of school, Human Rights Watch found, are the government’s under-investment in schools, lack of schools, prohibitive school fees and related costs, corporal punishment, and a failure to enforce compulsory education. Human Rights Watch also found poor quality within both government and low-cost private schools, a lack of government regulation of private schools, and corruption. In addition to these factors within the education system, girls are also blocked from attending school by external factors including child labor, gender discrimination, child marriage, sexual harassment, insecurity, and attacks on education. The Pakistan government has consistently invested far less in education than is recommended by international standards. As of 2017, Pakistan was spending less than 2.8 percent of its gross domestic product on education – far below the recommended 4 to 6 percent – leaving the government’s education system severely under-funded. Government schools are in such short supply that even in Pakistan’s major cities, many children cannot reach a school on foot safely in a reasonable amount of time. The situation is far worse in rural areas. And there are many more schools for boys than for girls. Aisha, around age 30, lives with her husband and their six children in an area of Peshawar where the nearest government school for boys, offering nursery school through 10th grade, is less than a five-minute walk away. The nearest government school for girls is a 30-minute walk and goes only through fifth grade. Aisha’s daughter left school when she was 9 because of her parents’ concerns about her safety walking to school. An “upward bottleneck” exists as children, especially girls, get older. Secondary schools are in shorter supply than primary schools, and colleges have even less capacity, especially for girls. Many girls who complete the top level at one school cannot access a school where they could go on to the next level. In the absence of an adequate system of government schools, there has been a massive growth in the number of private schools, many of them low-cost. But poor families often cannot afford any tuition fees and the government’s near-total failure to regulate and monitor these schools means that many are of poor quality.